According to UKIP’s deputy leader Paul Nuttall, Oldham is the “birthplace of UKIP”. Very appropriate then that Oldham UKIP has just been reported to the police for a shockingly racist election leaflet it’s been distributing. 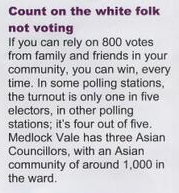 Ironic that in the leaflet UKIP complains the police won’t interfere in elections. It’s bit naive t think that was an official UKIP leaflet, more like some more of the continuing smear campaign. Also it isn’t the rumble to be started it’s the earthquake. Some people are easily fooled. More racial populism from the party that’s trying to market itself as non-racist and non-sectarian. More foolishness from UKIP – a party so stupid, calling their supporters kippers immediately places them a number of steps further up the evolutionary ladder. Fools. Barry, it’s quite clear that this is an official UKIP leaflet, so it’s not part of any kind of ‘smear campaign’ as you claim. It appears to have been written by a candidate in Oldham who used to be the election agent to Phil Woolas – convicted in court for the very kind of language that is used in this leaflet. Labour were happy for this racist stuff to go out when it was in their own name but now seem to have a problem with it. A plague on both their hoses. Barry, it’s quite clear that this is an official UKIP leaflet, so it’s not part of any kind of ‘smear campaign’ as you claim. 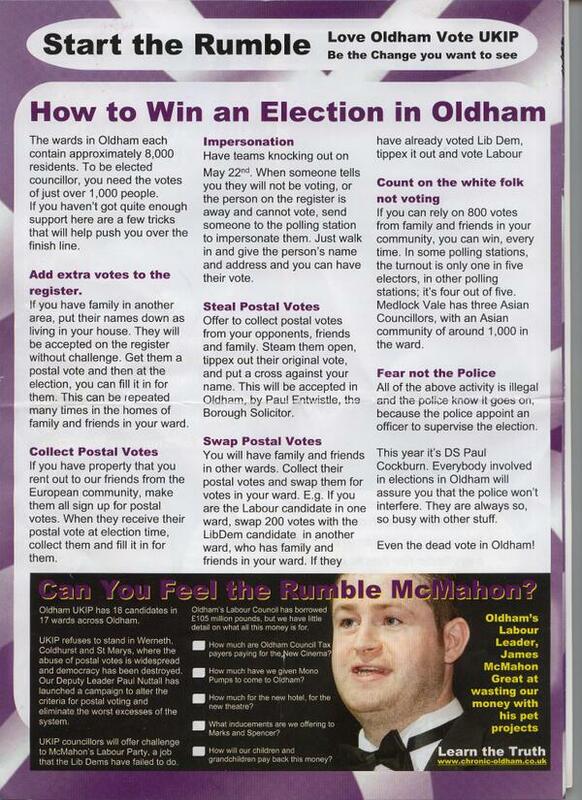 It appears to have been written by a candidate in Oldham who used to be the election agent to Phil Woolas – convicted in court for the very kind of language that is used in this leaflet. Labour were happy for this racist stuff to go out when it was in their own name but now seem to have a problem with it. A plague on both their houses. This is a very nasty tactic, but as far as I can see it’s not illegal. It’s very simple, if you don’t like racism and you don’t want to elect racist councillors, MEPs or MPs, then don’t vote UKIP! Sadly, many voters are unapologetically racist themselves, so they’re quite happy to vote UKIP. That’s democracy! The answer is to challenge racists and their racist thinking whenever you encounter it (including on this web site!) and only vote for candidates who you think match your own sense of morality. Glad my dad and his dad left Oldham in 1913 and that they are both gone now – so they would not have to be ashamed of racism in Oldham. So Peter… are all your ancestors British? Are you a UKIP voter?